Sunday. It was his 16th start overall. Colby Lewis started Sunday's game against the Twins for Texas. He went six innings, allowing two runs. It was his first "quality start" since 2012, which sounds a bit worse than it is (he missed 2013 with injury) but still isn't good for a a guy with 13 starts coming into the game. This got the radio boys, Cory Provus and Dan Gladden, talking about the merits of the quality start stat. (I spent most of the game in deadly battle with the weeds in the backyard garden spaces; it's probably the most time I've spent with the radio broadcast this season.) Provus had a fairly good, nuanced take on the value of the stat; a bit flawed, but mostly on target. Distilling Provus's opinion: He doesn't care for the quality start as an individual stat, because six innings/three earned runs is an ERA of 4.50, and that doesn't impress him. But on a team basis, if the starter gives up three runs in six innings, he's kept the team in the game, so if the team is getting lots of quality starts, that's good. There are two flaws in that. First is that the team getting lots of quality starts is getting them from individuals. If the QS is valid on a team basis, it's valid on an individual basis. Second -- and to me more important -- as so often happens, the criticism of the stat is based on the minimum requirement. Six innings/three runs is the worst QS. Most are better than the minimum. Lewis' was. His "game ERA" Sunday was 3.00, which is plenty good. Kyle Gibson's was even better: Eight innings, two earned runs, 2.25. Were I dictator of stats, the Quality Start would be tightened up a bit. Six innings as a minimum, yes. But make a game ERA for under 4 the criteria. Six innings/ two runs, that makes it; six innings, three runs would not. For a pitcher to give up three runs and get a QS, he'd need to work at least seven innings. Given the decline in scoring since the quality start state debuted, a stiffer standard is probably appropriate. I have no idea if Baker's flutterball is anywhere near good enough for pro ball, but I have theorized that if/when a woman plays major league baseball it will be a knuckleball pitcher, because that specific pitch might level the competition. Men, as a rule, are stronger and faster — better athletes — than women. I have no doubt that a truly elite female athlete — Serena Williams, let us say — is faster and stronger than me, but a Serena Williams trying to play second base in the majors isn't competing against a run-of-the-mill man for playing time, but against the likes of Robinson Cano or Eric Sogard. Cano's a star, Sogard's a platoon guy, but they are both pretty elite athletes in their own right. 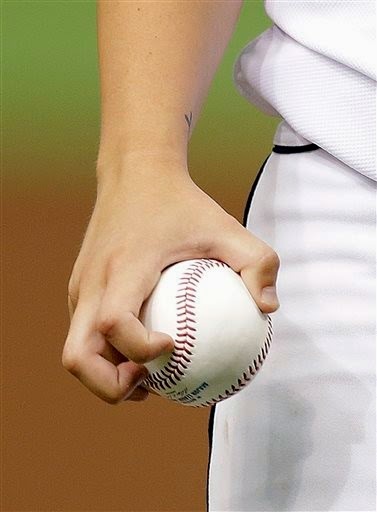 The knuckleball, however, is a bit less about physical abilities and a bit more about emotional stability. At risk of sounding overly mystical, the good major league knuckleballers seem to surrender to the pitch. There is athleticism involved, certainly, but at the heart of it seems to be a resignation to the unpredictability of the pitch. That aspect wouldn't seem out of reach for a woman. Again, I don't know if Baker's the one to challenge the gender barrier, but I'm open to the possibility. ninth inning Friday for his first major league hit. 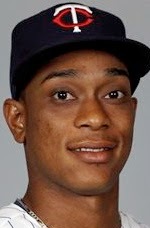 Jorge Polanco is in the majors because Trevor Plouffe, Eduardo Nunez and Danny Santana are injured. He's not in the lineup because ... ? Apparently because Pedro Florimon and his .093 batting average have some sort of squatters rights. When Plouffe and Nunez return, I assume it will be at the expense of Polanco and Florimon. Which is fine. Neither Polanco nor Florimon really belongs in the majors. Polanco should be in A ball, and Florimon ... I don't know what level he belongs at, but it ain't the bigs. I heard Ron Gardenhire on the radio pregame say he didn't intend to start Polanco this weekend, that it wouldn't be fair to the kid. I take Gardy's meaning as: He'll get carved up by major league pitching, and he didn't look good in the field during spring training. Polanco is, without question, raw. But I cannot see how he could be more inept at the plate than Florimon is, and he has supposedly stabilized in the field after several months of playing shortstop at Fort Myers. Polanco has come off the bench for three plate appearances in two games since his callup, and he's gotten a triple and a walk, scored a run and driven in two. We may wait a very long time for Florimon to do any of those things. Neither Polanco nor Florimon are the present. But Polanco might be part of the future, and Florimon should not be. If Polanco is on the big league roster, he should play. The Polanco call-up: Hip hip Jorge! a walk and scoring a run. The Twins on Thursday morning hustled Jorge Polanco across the country to sit on the bench for their afternoon game in Anaheim. It's quite a jump -- from Florida to California, from the high A ball Florida State League to the American League. Polanco is on the 40-man roster, so the Twins didn't have to waive somebody to get an infielder for a short-term stint. To make room on the 25-man roster, Yohan Pino was optioned out to Rochester one day after a too-short start. Presumably Sam Deduno will get the ball Monday when that rotation spot comes up again. As for Polanco: I saw him play several games last year for low-A Cedar Rapids. I'm not convinced he's a shortstop, and I'm quite sure he's not really ready to play in the majors, but I think he's going to have a major league career. I know this: I like Polanco's future a great deal more than Pedro Florimon's present. I understand why Florimon started Thursday with Polanco in the dugout, but I would 10 times rather see Polanco than Florimon. 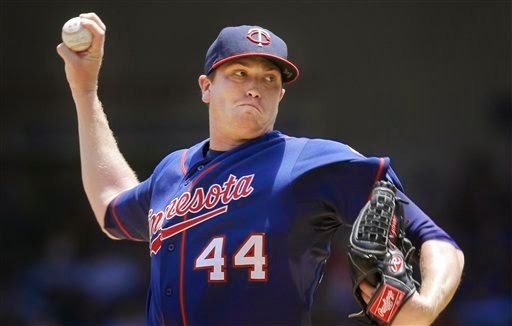 A third Twins farmhand was named Wednesday to a Futures Game roster: Trevor May, named to the U.S. squad to replace a pitcher who had been called up to the majors. I saw some social media consternation Tuesday over May's exclusion from the original roster, but as a rule no organization gets more than two prospects on the preliminary rosters. I have no problem at all with J.O. Berrios and Kennys Vargas getting the Twins' initial berths. At age 25, May isn't a real good example of what the Futures Game is supposed to be about: The brightest talents in the minors, regardless of closeness to the majors. May has a much better shot at playing in the majors this year than Berrios or Vargas, but he's not as highly regarded, certainly, as Berrios. Second-round draft pick Nick Burdi signed this week and was sent to Cedar Rapids. That is a more aggressive placement than we're used to seeing with college picks, and mirrors a similarly aggressive placement with first-round pick Nick Gordon. Gordon, fresh out of high school, was sent to Elizabethton rather than the complex league; the collegiate Burdi to low A rather than Elizabethton. The other college bullpen guys the Twins loaded up on in the early rounds were sent to E-Town, the Twins standard for college picks. 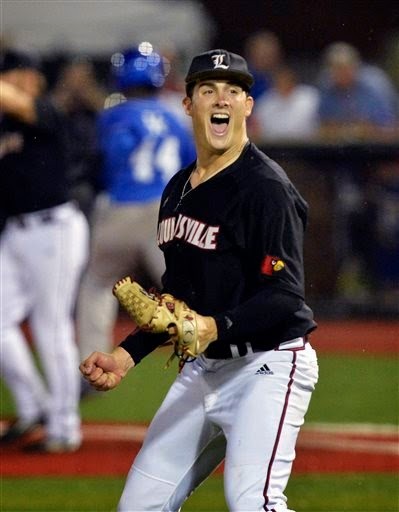 (John Curtiss, who like Burdi was pitching in the College World Series, has not signed yet.) So this more aggressive approach isn't universal. No surprise here: The Twins reactivated Aaron Hicks from the disabled list Wednesday and optioned him to Double A New Britain. The New Britain destination was signaled when they sent him there for the rehab assignment. What does interest me about this: Hicks isn't playing strictly center field there. He was in left the other day, and in right on Wednesday. Eddie Rosario started Wednesday at second base but finished the game in center. This may be an indication of where the two rank in the Twins current estimation. Bottom line: expect to see Rosario in the majors before we see Hicks again. I've been remiss of late posting this link: Here's my Monday appearance on KMSU's Southern Minnesota Midday show, talking Twins with Gully. Chief topics: What the Twins are doing with all these college relief pitchers, and why Aaron Hicks is at a career crossroads. You really know you're a prospect nerd if you're more interested in the Futures Game than in the All-Star Game. In which case, I am very much a prospect nerd. The Futures Game -- an annual USA-vs.-World contest that kicks off the All-Star festivities on Sunday -- will be July 13 at Target Field. When I ordered my tickets last winter, I was figuring that the Twins's two representatives would probably be Byron Buxton and Miguel Sano, just as they were in 2013. But both sustained significant injuries during spring training, and it's been obvious for some time that neither would be involved in this year's game. 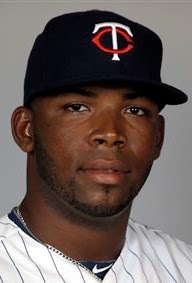 The Twins' contingent instead will be J.O Berrios, right-handed pitcher for the Fort Myers Miracle (High A ball) and Kennys Vargas, a switch-hitting "first baseman" for the New Britain Rock Cats (Double A). when he was still just 18. They're both having marvelous seasons, and Berrios in particular has been a highly regarded prospect from the time the Twins drafted him. The two Puerto Ricans are legitimate selections for the World team, even if they aren't Buxton and Sano. So July 13 figures to be their first taste of Target Field, and maybe their last for the year. Vargas is already on the 40-man roster, but I don't know how likely he is to be called up this year. Joe Mauer is at first base, and Kendrys Morales is the DH, they're the two highest-paid players on the team, and where would Vargas get at-bats? Outfield is NOT an option for him; he's listed at 275 pounds, and that may be an understatement. Barrios isn't on the 40 and he's in A ball, so he's not coming up this year. Indeed, I doubt he's going to move up to Double A. He turned 20 a month ago, and the Twins are using him in a six-man rotation (that's their policy in A ball and lower). Move him up to New Britain, and he'll have to jump into a five-man rotation. I don't think the Twins are going to subject his arm to that. As it is, he's one of the youngest pitchers in the Florida State League. This is not a BIG thing. It's one of those little things. Baseball announcers love to prattle about how important the little things are, and most of the time they are, to be blunt, wrong. "Productive outs" are just outs. You make a lot of productive outs, you make a lot of outs. The teams that make the most productive outs don't score the most runs, and they don't have particuarly good records in one-run games. A team gets 27 outs a game, and they are too valuable to squander. But double plays aren't just outs. They're TWO outs. And some managers -- Casey Stengel and Gene Mauch, to name two fairly famous ones -- were very good at making the double play a big advantage. On Monday morning I was poking around the Baseball Reference page for American League team stats, and I noticed that the Twins haven't grounded into a lot of double plays -- just 47 on the season. Only Seattle (among AL teams) has hit into fewer (42). Defensively, the Twins have turned 64 double plays, which is a bit below the league average (67). Still, this would appears to be an advantage of 17 double plays. I say "appear" because ... well, this stat isn't a zero-sum game. The offensive stat is, officially, "Grounded Into Double Play." It excludes the runner caught off base when a line drive is caught, or the baserunner thrown out trying to advance on a fly ball, or the ever-popular strike-em-out, throw-'em-out double play -- all of which are included in the defensive stat. For the 30 MLB teams, there were 1,674 GIDP but 1,972 double plays -- almost 300 more double plays than double plays hit into. Thirty teams, nearly 300 extra defensive DPs -- call it 10. Each team should have 10 extra defensive double plays. And of course they don't. The Twins, obviously, are +17. Tampa Bay, on the other hand, has 68 GDP on offense and just 38 DPs turned, -30. Which helps explain their sorry record so far this year. The Rays have hit into the fourth most double plays in the game and turned the fewest. In the AL Central, the first-place Tigers have the biggest edge -- 55 GDP, 77 DP, +22. The Twins are next, followed closely by the White Sox ( 57, 73, +16). Cleveland is +8 and Kansas City is -13. This is a complex topic, really. A basic truth about defensive double plays: Bad teams tend to turn more double plays than good teams, because they allow more base runners. Good offenses often ground into a lot of double plays, because they have more base runners. Last year the Twins led all of baseball in defensive double plays and hit into the second fewest. They were +75, but that said more about what was broken about the team than about something that was right. The Twins are turning fewer DPs this year, and that's to their credit. about whether he's a switch-hitter. A bit less than a month ago, Aaron Hicks decided to abandon switch hitting. This weekend, he decided to resume switch hitting. If May's decision to become a full-time right-handed hitter signaled a career crisis (as I said at the time) , the June change of heart deepened it. For the record, the Twins supported Hicks in May, and they supported his decision this weekend. But they hinted pretty strongly that their patience with this indecisiveness is wearing thin. My sense on this: Hicks made his May decision out of frustration. But the decision went against something that is integral to his self-identity as a baseball player. For better or worse, Hicks is a switch hitter, just as he throws right-handed. The question is: Is he a good enough switch-hitter to play outfield in the major leagues? The evidence to date says he isn't. But it's far from certain that he would be if he strictly hit right-handed. Even more, I think that if Hicks is to be a regular outfielder, he'll need more time in the minors working on his hitting than his current disabled list-rehab assignment will allow. Bringing Hicks back to the bigs this year, my view, puts him on a track to become a Sam Fuld-type bench player. Which, to be sure, may be the ultimate result even if they keep Hicks in the minors. of a College World Series game Tuesday. Looks a bit rough, doesn't it? 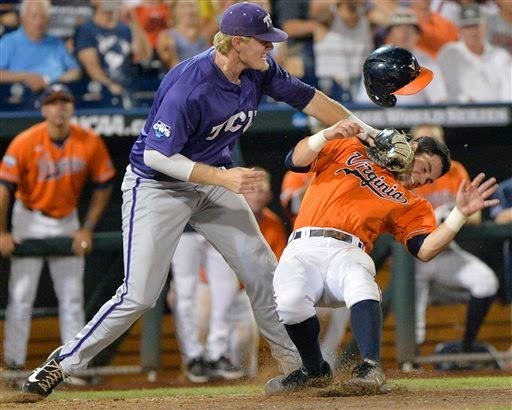 I know players are taught to apply the tag hard so it's obvious to the ump that the runner was indeed touched, but this looks more like a knockout punch. 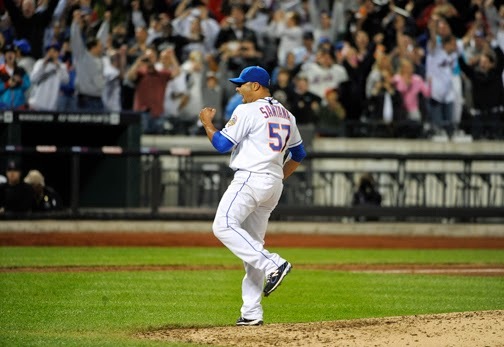 Johan Santana finishes his 2012 no-hitter for the Mets. It remains the only no-hitter in franchise history. The Twins have a Yohan (Pino). They have a Santana (Danny). But they don't have a Johan Santana. This is a couple weeks old, but I hadn't gotten around to noting or commenting on it. 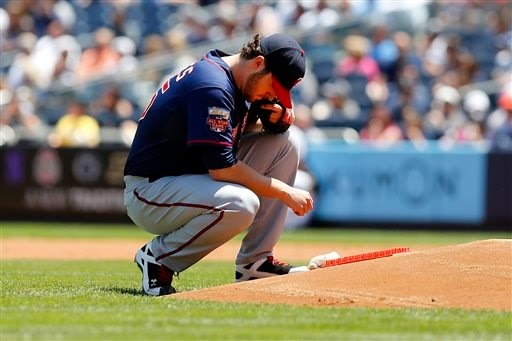 Earlier this month, the former Twins ace and two-time Cy Young winner tore his Achilles tendon fielding a ball. The Baltimore Orioles general manager described the tendon as "severed." So Santana's 2014 comeback is finished — and just before he was about to return to the show. A few days before the injury, he and the Orioles had agreed to push back his call-up deadline a bit, but he was close. By now, I believe, he would be getting a chance in the O's rotation. In his rehab outings this spring, he was short of even the velocity he had in 2012, and that was a good bit short of his velocity in his glory days with the Twins. But he was getting into the upper 80s — the territory of Yohan's fastball — and with the quality of his changeup, that would be usable. It would be if his body would just let him use it. I believe Santana is one of those talented, intelligent pitchers whose "pitchability" exceeds his body's capacity. If he can take the mound, he can be effective, but how often can he take the mound? That was a nice major league debut Thursday for Yohan Pino: Seven innings of five-hit ball, two runs allowed. But before we get too excited about the 30-year-old's performance, let us remember how Andrew Albers opened his brief major league career. And how quickly that dissolved. Pino has the Greg McMichael Rule working in his favor now: If you get outs, they'll find a role for you. There's precedent for pitchers of Pino's profile succeeding in the majors, of course. There's also plenty of precedent for them failing. He'll get some more starts out of this one, chances to demonstrate that he's more Carl Pavano than P.J. Walters. Or vice versa. Here's something that truly works in Pino's favor: He got swings and misses Thursday. Yes, he struck out seven White Sox hitters in seven innings. He also got 13 swinging strikes in 94 pitches, just under 14 percent. Having evoked Albers as a cautionary tale, I should acknowledge that that "process" stat indicates a significant difference between Pino and Albers. That's about double Albers' rate of swinging strikes in his major league season (10 starts). It's only one start for Pino, but I'm confident Albers never got 13 swings-and-misses in a game. The roster issue got resolved in a non-decisive manner. Mike Pelfrey went on the 60-day disabled list, which opened a slot on the 40-man roster, and Eduardo Nunez went on the 15-day disabled list, which opened a spot on the 25-man roster. So the Twins (for now) avoided having to cut somebody loose. They also are now carrying 13 pitchers, which is not optimal. Alex Meyer throws a bullpen session in spring training. On Wednesday, in my discussion of why the Twins bypassed a handful of real prospects in picking a rotation replacement for Sam Deduno, I mentioned the probable innings limitations on Alex Meyer as a reason the Twins top pitching prospect wasn't a likely callup. Then there's this: Wednesday night Meyer threw 78 pitches in three innings. In contrast, Clayton Kershaw of the Dodgers threw 107 pitches that same night in his 15-strikeout no-hitter. Kershaw, of course, is a high standard to meet. But the Twins aren't going to call up Meyer to throw 26 pitches an inning. They can get that from Deduno. It starts with Sam Deduno's string of poor starts. In his last four starts, he went a total of 16 innings, allowing 18 runs -- an ERA of 10.13. Since he's pretty much a marginal rotation guy anyway, there was no reason to stay the course with him. And the Twins announced Monday that he's returning to the bullpen. Alex Meyer, their top pitching prospect, is 4-3, 3.62 in 64.2 innings while striking out more than 10 men per nine innings. Trevor May is 7-4, 2.77 in 77.2 innings, striking out more than nine men per nine innings. Logan Darnell has a 2.75 ERA in 11 starts with an 8.6/9 K rate. Kris Johnson is 6-2, 2.60. May, Darnell and Johnson are all on the 40-man roster. Meyer is not, and the Twins are probably going to limit his innings after an injury-shortened 2013. Darnell's rotation turn is Thursday, so he lined up with the first start Deduno isn't going to make. He would have been my choice to supplant Deduno. Instead, the Twins selected Yohan Pino, a 30-year-old with more than 1,200 minor league innings and a fast ball that tops out in the upper 80s. Pino is best known, if known at all, as the guy the Twins sent to the Cleveland Indians in 2009 in the trade for Carl Pavano. My issue with this choice is not that Pino is pitching poorly for Rochester. He's 9-1, 1.92, with 61 strikeouts in 61 innings and a wonderful 3.81 strikeouts for every walk he's surrendered. It's that there is no future here. Meyer is an important piece of the future. May and Darnell might be. Pino is not. But there's another aspect to this: How the Twins open the necessary roster spots for Pino. They need a spot on both the 40-man roster and the 25-man roster. They could get the first by moving Mike Pelfrey to the 60-day disabled list, but not the second. Designate Matt Guerrier for assignment and clear out the last of the Nostalgia Boys. Guerrier has a solid 2.81 ERA, but his supporting stats are considerably weaker. Designate Chris Parmelee for assignment and go with a 13-man pitching staff. Parmelee cleared waivers at the end of spring training, mashed at Triple A, got a new chance in the majors and ... is hitting .174. My guess is Guerrier gets the ax. But my guess would have been Darnell for the open rotation slot. who specialized in hitting the ball there. Tony Gwynn, who died Monday, wasn't really a one-trick pony. He was, at least in his 20s, a good to outstanding base stealer, with a career high of 56. He won six Gold Gloves. But what really stood out during his career, and what jumps out from his stat line: He could hit for average like nobody else. Well, not quite like nobody else. He stands in a line of left-handed high-average hitters who thrived on hitting the ball the other way. Rod Carew. Wade Boggs. Joe Mauer. It's a recipe for batting titles, and Gwynn was about as good at it as anybody in baseball history. He called his favorite spot on the field the "5.5 hole" -- the space between the third baseman, No. 5 in scoring symbols, and the shortstop, No. 6. And he won eight batting titles largely on his ability to slap pitches there. Gwynn grew up in San Diego. He went to college at San Diego State, where he played both baseball and basketball (and set, in the latter sport, the school's assist record). He played his entire career in San Diego. And after his playing career ended, he returned to his alma mater to be the baseball coach. The hometown boy stayed put. A few years ago I did a little digging on how much hitting with two strikes drags hitters down. As detailed in this post, even great hitters are diminished with two strikes. Tony Gwynn, for his career, hit better than .300 with two strikes. the Twins announced was rib cage inflammation. The Twins had a fairly discouraging weekend in Detroit. A good win on Friday, yes. But Saturday ... not only did Sam Deduno have another horrid outing, but the infielders started dropping. Brian Dozier has a sore back. Eduardo Nunez tweaked a hamstring. 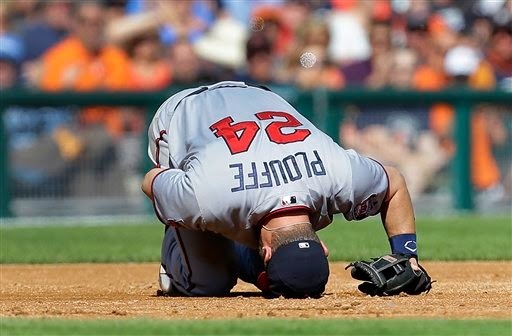 Trevor Plouffe has something akin to an oblique strain. Putting Plouffe on the DL should have been an easy call even without the other problems. Injuries to that area are not really day-to-day issues, nor are they treatable with anything other than rest. Yet the Twins track record suggests that, absent the other injuries, they would have waited to make a move. And given the "quality" of the move they did make, one can make a case for reluctance. Pedro Florimon is back. He didn't hit at Rochester (.230 batting average), and that's to be expected. He was also atrocious in the field (11 errors in 32 games at shortstop), which is not to be expected. His glove is supposed to be the rationale for playing him. If he can't hit and can't field, what's the point? the Twins made a hurried move, perhaps without thinking it through. Florimon really does nothing to bolster the infield depth issue. Counting Dozier as injured, the Twins have three healthy players for second, third and short -- Danny Santana, Eduardo Escobar and Florimon -- and they're all shortstops. Neither Santana nor Florimon has played much second base the past two years, and Santana is supposed to be the center fielder anyway. James Beresford or Delbinson Romero would have been better callups. Neither is on the 40-man roster, but the Twins know Mike Pelfrey isn't returning anytime soon; he can be shifted to the 60-day disabled list, which would open a spot on the 40. And, really, it makes more sense to designate Florimon himself for assignment than to bring him back to the majors. I was happy this week to see Go-Go in line for a starting berth for the All-Star game in the most recent balloting for the National League. He may not win a lineup place — the third spot is close between him and Andrew McCutcheon, and Cutch is only the defending NL MVP — but he wouldn't be an embarrassment if he does win. And an All-Star lineup with both Gomez and Yasiel Puig might drive the self-anointed Guardians of the Unwritten Rules right up the wall. * Jason Kubel cleared waivers and declined a minor-league assignment. So the Twins will release him. Kubel was designated for assignment to make room for Kendrys Morales. This may be it for Kubel as a major league player. He's only 32 and wacked 30 homers for Arizona as recently as 2012, but his bat just up-and-died in midseason of that year. Seriously: At the All-Star break in 2012 he was slashing .293/.367/.533; after the break, .201/.275/.470. Still a good slugging percentage, but the homers was all he did ... and it got worse from there. So it's been about two calendar years since he was a truly good hitter. * Aaron Hicks went on the disabled list Friday after getting his sore shoulder examined. Sam Fuld was reactivated from the concussion DL. It's possible Hicks would have been optioned out this weekend to make room for Fuld had he not gotten hurt. He needs more regular at-bats, especially against righties, as he transitions from switch-hitting, than he was going to get in the majors. * Mike Pelfrey had surgery to remove scar tissue in his right elbow that was pressing on his ulna nerve and causing tingling in his pitching arm. He kept saying he was healthy, but the radar gun readings said something was wrong. Presumably this was the something. *Eric Fryer was indeed the callup to replace Josmil Pinto as the No. 2 catcher. Chris Herrmann was at the same time reactivated off the minor league disabled list. John Sickels is one of my favorite prospect gurus. He run the Minor League Ball blog for SB Nation and publishes an annual prospect book, and while the former Bill James assistant seems not to get the blogger slurping that Keith Law of ESPN gets, he's good at what he does. Had the book come out in its usual time frame (spring training, not amateur draft), I would have tossed Sickels ratings in with the Law/Baseball America/MLB.com lists. I'll do so now. Sickels's Top 100 is actually two lists: Top 50 pitchers and Top 50 position players. While he doesn't give a precise order outside the overall Top 50, Sickles gave grades of B- to four minor league hitters: Josmil Pinto, Jorge Polanco, Max Kepler and Travis Harrison. Danny Santana got a C+. The other prospect lists generally agreed that Polanco rates above Santana, but would dispute ranking Harrison and Pinto higher than Santana. As for pitchers: Alex Meyer (23) and Kohl Stewart (34) both made Sickels' top 50. Both are B+. Jose Barrios is a "B" but, like Rosario, not a strong enough B to crack the bottom of the list. Meyer-Stewart-Barrios fits the consensus of the organizational rankings. Oswaldo Arcia makes a sliding catch in Toronto. 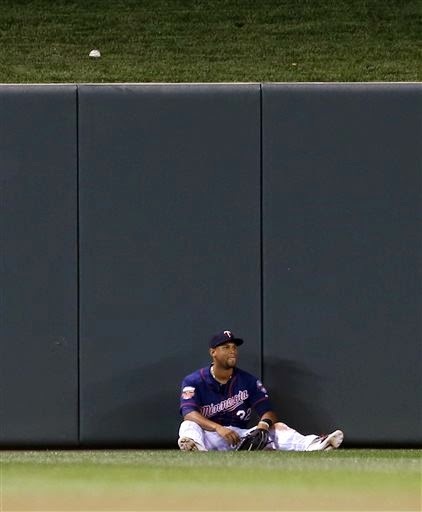 Oswaldo Arcia twisted an ankle while running the bases last weekend, and when the Twins got to Toronto there was some question about whether he was ready to play in the outfield. But Ron Gardenhire wrote him in the lineup with the explanation: He ran around in pregame practice and missed all the balls he'd normally miss during a game. 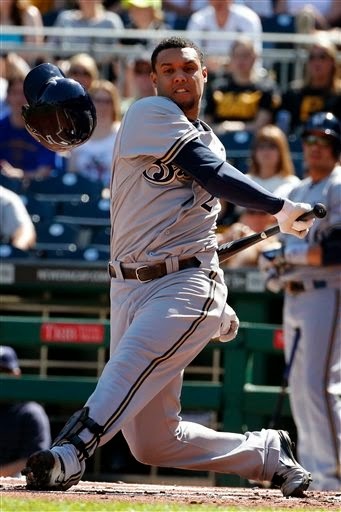 Funny, yes, but rooted in the reality that Arcia in 2013 was a brutal outfielder. He's looked a bit better in his limited playing time this year, however. That eyeball perception is, perhaps, helped by the regular sight in April of Chris Colabello in right field; Arcia couldn't help but be an improvement. It has probably helped that he's been strictly a right fielder; he saw more time in left field than in right last season. It was as a left fielder that he got conked on the noggin by a foul ball, the kind of lowlight that helps stick a "bad glove" defensive reputation on a player. The Twins played a night game Tuesday; Kurt Suzuki caught. They played a game about 13 hours later; Suzuki caught again. When the No. 1 catcher catches a day game after a night game, it's a serious sign that the manager isn't enthused about his No. 2 catcher. 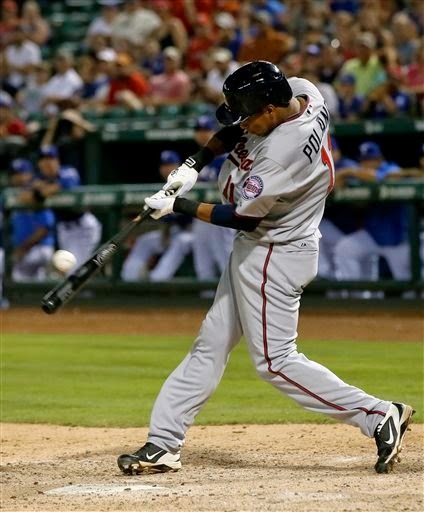 The Twins announced after Wednesday's game that they were demoting Josmil Pinto. A corresponding move will be made Friday (saving a day of service time/major league pay). Presumably the corresponding move will be bringing up Eric Fryer, since Chris Herrmann has been out of action for about a week. This move was pretty much inevitable with the signing of Kendrys Morales. In April, Pinto was essentially the regular designated hitter. His at-bats in that role dried up when the Twins demoted Herrmann, who never actually caught an inning for the Twins but still served as a security blanket. Without regular at-bats, Pinto's hitting tailed off in his sporadic starts. Worse for his chances of remaining on the big league roster, his defensive shortcomings became ever more apparent. I argued at one point that restoring a third catcher would be worthwhile if it got Pinto back into the DH role. That proposition is now moot; Morales is the DH. I'm not sure that a Triple A stint is going to do much for Pinto as a receiver. It seems likely Terry Steinbach, as a catching instructor, is better than the Rochester staff. But then, I suspect that if Pinto hasn't mastered the intricacies of catching by now, in his ninth season of pro ball, it may not happen. Still, a steady dose of playing time might get Pinto's bat going again. Right now, it's difficult to blame Ron Gardenhire for leaning on Suzuki. He's not only superior defensively to Pinto, he's been surprisingly productive as a hitter. At some point, however, Suzuki is likely to stop hitting .300. When that slump comes, it would be nice to have Pinto ready to hit again. At this point, he's a bit of a mess at the plate and behind it. What next in center field? Aaron Hicks apparently injured a shoulder making a diving catch to end Saturday's game. He hasn't started the past three games (although he did pinch run in one of them), and there was chatter Tuesday that he may go on the disabled list as soon as today. Hicks decided on May 26 that he would abandon switch-hitting and stick to the right side. He has since then gone 5-for-19 with four walks, a slash line of .263/.391/.316. Twenty-four plate appearances don't prove very much, but I'm not sure you can find another stretch of 24 plate appearances in his brief career in which he hit .263, much less reached base more than 39 percent of the time. Still, between the injury and the significant switch in his game, there's reason to doubt that he should be on the major league roster. One big reason he remains on the roster: a lack of reasonable alternatives. Enter, perhaps, San Fuld, currently serving a rehab assignment in New Britain as he prepares to return from his concussion. Should Hicks go on the DL, Fuld probably gets reactivated. And Danny Santana doubtless gets a steady diet of center field time. Santana has produced so far, but his major league numbers far outstrip his minor league stats. He's not this good. But one cannot blame Ron Gardenhire for riding him while he hits. The center field option that intrigues me most is probably at least few weeks away from getting a shot: Eddie Rosario. Rosario had a late start to the 2014 season because of his drug suspension. Once eligible, he spent a bit more than a week at High A Fort Myers shaking off the rust (.300/.382/.300 in eight games), then moved back to Double A, where he finished 2013. In his first three games there, he went 6-for-13 with a double and a homer. Rosario was a center fielder when he started his minor league career. The Twins a couple of years ago started trying to convert him to a second baseman, and the reviews on that have been mixed. I assume he's a better defensive outfielder than defensive infielder; the rationale for trying to switch him was rooted in (a) the other center fielders in the organization and (b) a sense that he may not have the extra base thump to be a corner outfielder. When somebody asked Gardenhire a few days ago about converting Santana's primary position from shortstop, Gardy said something along the lines of We all know what's coming there. Referring, of course, to Byron Buxton. But Buxton isn't an answer to the immediate question. Right now, the Twins have four possible answers to the question: Who's our center fielder? To one degree or another, they've tried three of them. I fully expect that before long they'll try the fourth. Nick Gordon and Terry Ryan at Monday's press conference. 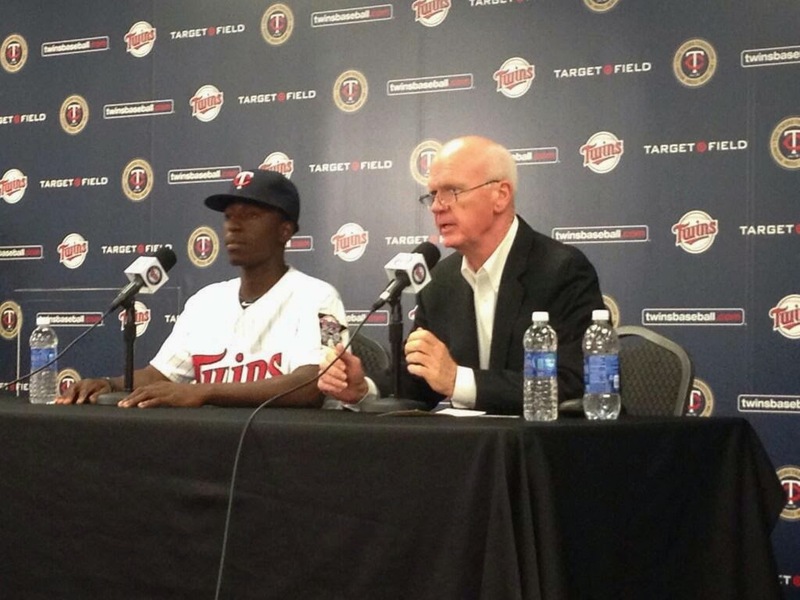 The Twins signed first-rounder Nick Gordon on Monday. That he was a quick sign wasn't a surprise. What did surprise me was that the Twins will have him start at Elizabethton in the Appy League. Their standard practice with signees fresh out of high school is to have them play, at least for a few weeks, in the Gulf Coast League for their complex team at Fort Myers. College picks are more likely to be assigned to E-town upon signing. It's probably been more than a decade since the Twins had a high schooler skip the GCL (Joe Mauer in 2001). 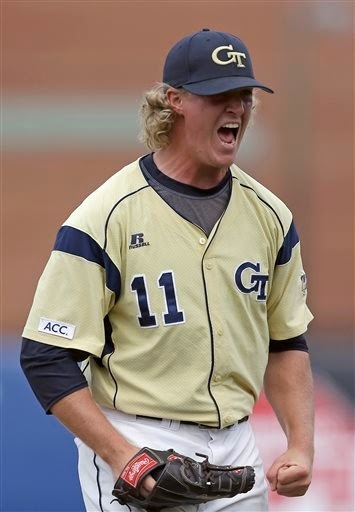 Terry Ryan said they're confident Gordon is capable of dealing with the more advanced pitching in the Appy League. But he also implied -- correctly, in my opinion -- that nobody should read too much into whatever numbers Gordon puts up this summer. Ryan specifically cited Byron Buxton, who he said didn't put up big numbers in that first summer of pro ball. And yeah, Buxton hit just .242 over two levels of rookie ball in 2012: .216 for Fort Myers, .286 when he was moved up to Elizabethton. By all accounts, Buxton took some big steps forward in instructional ball during autumn. How the Twins might well, should they slide out of the playoff picture, turn around and trade Morales. Morales is truly a no-lose signing. He's not blocking, at least for this year, anybody who really deserves a chance to play. Well, that may not be completely true. One can argue that Morales will keep Josmil Pinto from seeing regular time as the designated hitter. But the reality is that Ron Gardenhire isn't going to use Pinto as a regular DH without a third catcher on the roster, and the front office isn't going to give Gardy a third catcher he doesn't going to use. The decision to dump Jason Kubel was inevitable. He hadn't had a hit in his last 31 plate appearances (0 for 26 with five walks and 12 strikeouts). His last extra base hit came on April 25. His final slash line -- .224/.313/.295 -- is uncomfortably close to his 2013 line -- .216/.293/.317. Kubel is one of many players who might well wish to try this career over. We can only wonder how things would have played out for him had he not wrecked his knee in the Arizona Fall League back in 2004. At the time, the Twins viewed him as a hitting prospect at the same level as Joe Mauer and Justin Morneau. Life didn't work out that way. Even with the chronic knee issue, Kubel was a dangerous hitter for several years. He might have been even more dangerous had he played for a manager who valued platoons. Kubel's final start with the Twins, fittingly, came against a left-handed pitcher. At this point, it probably didn't matter. Had the Twins signed Morales any earlier, they would have forfeited the 46th pick in this year's draft. And the money allotted to their bonus pool for that pick (more than $1.2 million) would have vanished as well. Instead, the Twins got to pick Nick Burdi (who they also drafted out of high school in 2011 but didn't sign). Burdi is the closer for the University of Louisville. His college season is still going; the Cardinals earned a berth in the College World Series this weekend. It seems likely that adding Burdi to the organization is worth two months of Kendrys Morales. 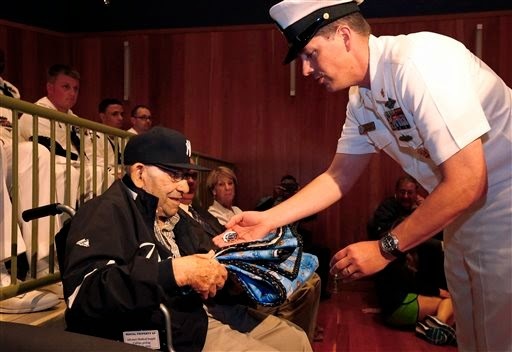 Friday at the Yogi Berra Museum in Montclair, N.J.
Friday was the 70th anniversary of D-Day. Yogi Berra is 93 now and attended Friday's ceremony honoring his small part in D-Day in a wheelchair. I've linked before to this story about Berra and D-Day. He's the one Hall of Famer I know of who took part in the invasion. And all those guys -- infantry, sailors, aviators -- deserve credit and honor. Berra's playing career was well past when I started paying attention to baseball. My real first memory of him is as the manager of the 1973 "You Gotta Believe" Mets, who won an improbable pennant and took the Mustache Gang A's to seven games in the World Series. Tom Seaver at the peak of his powers, Willie Mays at the end of his. It suddenly occurred to me as I looked at the photos from Friday's event: I'm older now than Berra was when he skippered the Mets to that Series. It was a long time ago. Ducks this year, but he was a starter for two years first. A rather odd second day of the draft for the Twins as they went really heavy on college relief pitchers. They did this in 2012, when they loaded up on the likes of Luke Bard (supplemental round), Mason Melotakis (second round), J.T Chargois (second round), Zach Jones (fourth round), Tyler Duffey (fifth round) ... Power arms, all of them, and used out of the bullpen by their college coaches. championship game for Georgia Tech. The Twins tried some of these guys as starters, and the results have been mixed at best. Bard and Chargois have barely pitched at all because of injuries, and Jones had surgery this winter for a shoulder aneurysm. Melotakis, after spending most of 2013 in the Cedar Rapids rotation, has been mainly relieving in Fort Myers. Duffey has pushed his way up to Double A and has been strictly a starter to date this year. Between Thursday's second round and Friday's picks, the Twins took five college bullpen arms in a row. I expect they'll try some of those guys as starters. Curtiss was probably relieving for the Longhorns in part this year because he's still recovering from significant surgeries as a sophomore (both Tommy John and the removal of a rib). 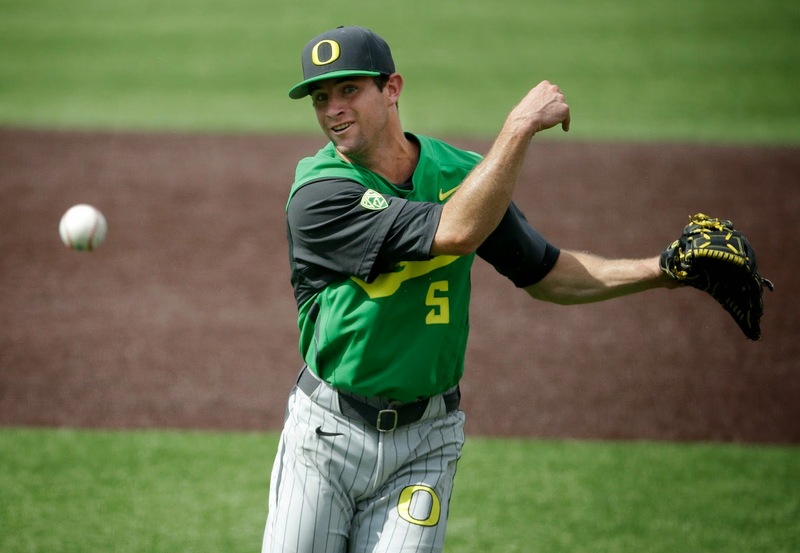 Reed started for two years for Oregon State become taking the closers job as a junior. The Twins took three more college pitchers, all of whom were starters, in the seventh, eighth and ninth rounds. So far they've taken just two position players, one of them in the first round. This was seen as a pitching-heavy draft, and the Twins sure went heavy on the pitchers. Today the draft goes though the final 20 rounds. The Twins might sign about half those picks, and the odds are that they'll be "organization guys" — players they sign so that they have enough bodies to stock the lineups in the entry-level leagues. No drama for the Twins in the first round of the draft Thursday. As predicted in virtually every mock draft for a month, they took shortstop Nick Gordon. Despite my frets that Houston would gum up the works, the three big arms went 1-2-3 and the Cubs went with a cheaper college bat. Which left the Twins with the guy everybody figured they wanted. If you read this blog regularly, you know what I know about Gordon: High school kid, expected to stick at shortstop, son of long-time big league pitcher Tom Gordon, brother of Dodgers second baseman Dee Gordon. He's not as fast as his older brother, but he's stronger and is expected to be a better hitter. So Twins landed the consensus best shortstop in the draft field. They have not developed a quality shortstop on their own in a long time. The best shortstops in team history, at least since Zoilo Versalles (who came with the Twins from Washington) came from other organizations: Leo Cardenas from Cincinnati, Roy Smalley from Texas, Greg Gagne and Cristian Guzman from the Yankees, Jason Bartlett from San Diego, J.J. Hardy from Milwaukee. The Twins spent their second round pick on another Nick: Nick Burdi, a right-handed reliever from the University of Louisville. Burdi fits a relatively recent trend for the Twins in the draft: a collegiate power arm who has been used primarily in relief. Burdi is said to have hit triple digits on the radar guns on occasion. The Twins drafted a number of guys in this mold in 2012 with the intent of trying some of them as starters (which is, apparently, not the plan with Burdi). The returns have been mixed at best. A couple of those power arms (Luke Bard and J.T. Chargois) have been injured more often than not. Nobody has pushed their way to the majors, or to the brink of the majors. And that's it for the Twins on the first night of the draft. Today will be rounds 3-10, and it's fairly significant. The remaining 20 rounds are on Saturday, and that's largely organization filler. Jim Callis and Jonathan Mayo of MLB.com each posted their mock drafts. Surprise: They both have the Twins taking Nick Gordon. Callis gets there with Brady Aiken (Astros), Carlos Rodon (Marlins), Tyler Kolek (White Sox) and Michael Conforto (Cubs) going ahead of Gordon; Mayo's first three are the same, but he see the Cubs taking Kyle Schwarber. Both have Alex Jackson and Aaron Nola slipping past the Twins to the Mariners and Phillies. Keith Law said in his weekly chat that he's hearing the Twins aren't as set on Gordon as he thought, with Kolek a legit possibility should be reach No. 5. And, finally, John Sickles did what he called a "thought experiment" based on the premise I had in my previous post — that the Astros take Gordon with the first overall pick. Sickles' notion is that the Twins would go with Aaron Nola if available, Sean Newcomb if Nola isn't. He has Kolek sliding past the Twins. What I expect: All these people who spend far more time than I do scouting and talking to scouts are convinced the Twins will take Gordon. Who am I to dispute that? Baseball America's mock draft 5.0 still has the Twins taking Nick Gordon, and called it "The pick the industry seemed most sure about." What would most likely get in the way of it, BA says, is Houston or the Cubs making a below slot deal with Gordon. I doubt it with the Cubs, since they pick just one slot ahead of the Twins, but Houston I can see. The Astros did this in 2012, the Byron Buxton draft, with Carlos Correia. My completely uninformed gut says Houston's front office really wants to make that kind of pick if only because they want to make sure everybody knows they're the smartest guy in the room. If they really want to, they will. It might not be Gordon; it might be Aaron Nola. If Tyler Kolek believes he's sliding, he might be the guy who says yes to a significantly-below-slot-for-the-first-pick offer that still figures to be higher than the money going to the seventh pick. But Gordon's the most likely target in my eyes for such a scenario. And I really haven't seen a mock that starts with that notion. 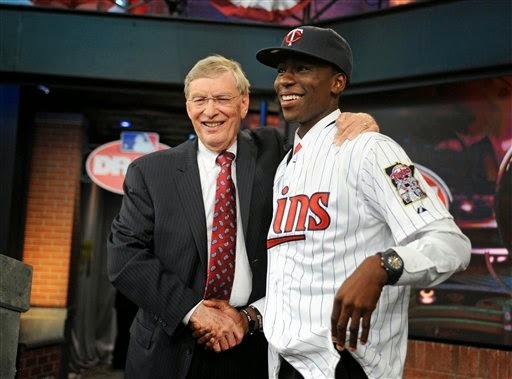 That annual baseball anti-climax popularly known as the amateur draft gets started this evening — 6 Central on MLB Network and MLB.com — with high school shortstop Nick Gordon apparently still the consensus pick for the Minnesota Twins at No. 5. Which would be fine by me. What's interesting/worrisome is that there seems to be a lot of ways the mock drafters get to that point. ESPN's Keith Law last night on Baseball Tonight said Tyler Kolek, the Texas prep right-hander deemed the highest velocity arm in a draft field at least since Nolan Ryan (who was in the first draft in 1965), is sliding down the boards. When Law and others started issuing mock drafts about a month ago, Kolek was a consensus top-three pick; now Law has him going seventh. (Law, again, had the Twins taking Gordon). Kolek's slide, if it is indeed happening, fits the internal history of the draft. No prep right-hander has ever gone 1-1. (Two prep lefties have, David Clyde and Brian Taylor, and they became cautionary tales, not stars.) I saw a line a week or so ago from an unnamed veteran of the scouting game to the effect of "High school pitchers shine on the field, college pitchers shine in the draft room." Meaning that when the execs start balancing potential with cost, the older pitchers whose futures appears more certain look like the better bet. Kolek is a big body with off-the-charts velocity. Not everyone is sold on his athleticism and his command, and there is a growing belief that an 18-year-old throwing 100 consistently is an surgery waiting to happen. Still ... Law last night had the White Sox (pick No. 3) taking LSU's Aaron Nola. Nola is certainly going to go Top 10 at the least; he may well be the safest pick in this draft field. He may also be the lowest-payoff ticket in this lottery. I find it difficult to believe the Sox would pass on Kolek to take Nola, even if they believe Nola will be in the majors this summer. I expect to see mocks this morning from Baseball America's John Manuel and MLB.com's Jim Callis, and probably one or two others, and will comment accordingly. the media before his debut Tuesday. 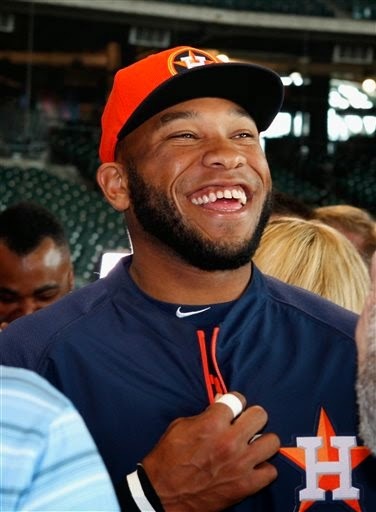 Jon Singleton made news twice with his major league debut Tuesday. The bigger news was the deal he agreed to with the Astros before he stepped on the major league roster: Five years, $10 million guaranteed, with three club options. If Houston picks up all the options, it's an eight-year, $30 million deal, and Singleton won't get to test free agency until age 30. This contract is the first such for a player who hadn't debuted in the majors, although Evan Longoria signed a comparable deal about a week into his rookie season. It's also, albeit on a much lower level of commitment by both sides, along the lines of something I suggested this spring for the Twins regarding Miguel Sano and Byron Buxton. Ten mil (the amount Singleton gets even if he crashes) is a life-changing figure, but some players and former players quickly rapped Singleton for signing. Their contention: He low-balled himself. There's more money to be had if he's great. I'm not so sure he made the wrong choice. While Singleton has been a fixture on Top 100 prospects lists — ranking as high as No. 25 a couple years ago on the Baseball Prospectus list — he's no sure bet for stardom. His Triple A numbers (slash line .241/.366/.434 in 533 plate appearances in 2013-14) aren't particularly strong for the Pacific Coast League. Perhaps more troubling: Last season he served a 50-game suspension for a second drug-of-abuse violation, admitted an "addiction" to marijuana and spent a month in rehab. James Loney, the Tampa Bay first baseman, is a not particularly good comp to Singleton as a talent — Singleton is more of a power hitter, Loney a line-drive hitter — but Loney offers a reasonable example of a "normal" salary trajectory for a regular first baseman who falls short of star status. He got the minimum or just above until he became arbitration eligible, when he moved into a range of $3 million to $7 million. He hit free agency after his age 28 season having earned $14 million to $15 million. His contracts since then, reaching through the 2016 season (his age 32 season) will total an additional $18 million, for roughly $32 million for his career to that point. We don't know if Singleton is going to be a better or worse player than Loney. We do know what he'll be paid the next five years. If he turns into a star, yes, he left a lot on money on the table. If he matches Loney, it's a pretty fair deal. And if he tokes his talent away, he still gets $10 million. in the eighth inning Monday. About 13 months ago I recounted the career path Carlos Gomez, once the Twins center fielder and now a centerpiece of the Brewers lineup. I concluded that Gomez was better than Denard Span, the man who took the center field job from Gomez, an assertion that was quickly disputed in the comments. I don't think it's disputable now. Span since leaving the Twins: .277/.325/.380. 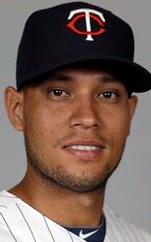 Gomez since leaving the Twins: .267/.321/.463. Go-Go made the All-Star team last year, won a Gold Glove, finished ninth in the MVP voting. He's been even better this year. Span has never made an All-Star team, never won a Gold Glove, never drawn even a 10th-place vote in the MVP balloting. And he's two years older than Gomez. There's been speculation already that the Nationals will decline Span's $9 million option for 2015. The Brewers aren't letting Gomez get away. in Yankee Stadium as a member of a visiting team. Sunday: Phil Hughes went eight innings, allowing two runs on three hits and two walks. Saturday: Kevin Correia, my least favored of the starters, went six innings and allowed just one run. 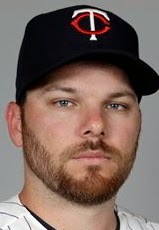 Friday: Ricky Nolasco also had six innings of one-run ball. Nolasco did walk four with just three strikeouts and allowed seven hits, 11 baserunners in 18 outs; Correia had nine hits and one walk, 10 baserunners. So the one-run outcomes seem a bit deceptive. They didn't pitch THAT well. Still, three quality starts in the tater haven that is the newest rendition of Yankee Stadium isn't bad at all. 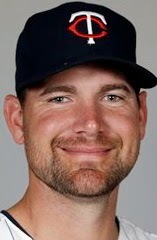 Mike Pelfrey interrupted his rehab assignment to have his arm checked out, and what is described as minor nerve irritation was found. He is to have a second exam done by the noted Dr. James Andrews. So he's not close to returning, which is probably for the better. I'm in no hurry to see him pitch again. 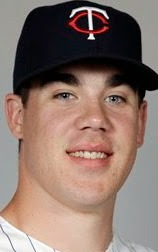 Prospect Trevor May, pitching for Triple A Rochester, blew away Gwinnett (Atlanta) with seven shutout innings in his most recent start. He's now 5-3 with a 2.62 ERA and a batting average allowed under .200 for the Red Wings. He's also sporting his lowest walk rate since A ball. May isn't the only Red Wings starter impressing. Kris Johnson, who came up to start the second game of a doubleheader, has a 1.83 ERA. Logan Darnell, who also had a brief call-up, has a 2.54 ERA with more strikeouts than innings. And Alex Meyer, generally regarded as the best pitching prospect in the organization, has a 3.31 ERA while fanning 10.8 hitters per nine innings. (He's also got a high walk rate). May, Darnell and Johnson are on the 40-man roster, while Yohan Pino is not. Poor Pino, who has picked up a handful of starts, only has a 1.73 ERA. The Red Wings have a team ERA of 3.14, and I can only imagine how low it would be without old friend Scott Diamond's 7.51. I don't see Diamond returning to Minneapolis anytime soon. A lot of guys ahead of him. Here's the thing: One can make a case for bringing up any of the May-Meyer-Darnell-Johnson quartet for the Twins rotation. (I'm arbitrarily leaving Pino out on the basis that the other four are younger and better prospects for the future). But for whom? Certainly not for Hughes, who has been superb. The Twins have too much invested in Nolasco to change course on him after two months. Kyle Gibson has been up and down, but the Twins really do need to give him a clean shot. Deduno ... well, his injury history suggests he's not likely to finish the year in the rotation. I'd say keep him in the rotation until he gets hurt. The Twins will have rotation openings this summer. But they need not be in a hurry to create them. 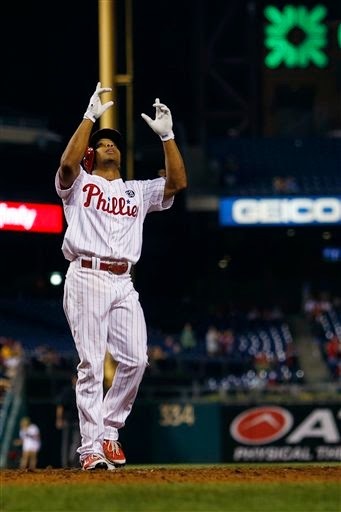 Old friend Ben Revere hit his first major league home run Tuesday. It only took the former Twins outfielder 1,466 plate appearances to get his first dinger. I always figured Revere's first four-bagger would be an inside-the-park job, but he actually muscled it over the fence. There have been players who took longer than Revere to homer, but like him, they did eventually get a dinger. The longest career-opening homerless streak since 1947: Greg Gross, who was, like Revere, a left-handed hitting outfielder who was very good at making contact but very poor at hitting the ball a long way. Gross had a 17-year career in the 1970s and '80s, mostly as a platoon outfielder/pinch hitter. It took him 1,888 plate appearances between 1973-1977 to homer. Gross did wind up with seven career homers; a goodly part of his long drought might be attributed to opening his career with the Astros. The Astrodome was never a good park for power, and guys like Gross were bound to see their best drives swallowed up. Revere, on the other hand, has a bandbox for a home park now. He was bound to get one sooner or later.